Stirton Burrow in Stirton, near Skipton, Yorkshire sleeps 2 people. 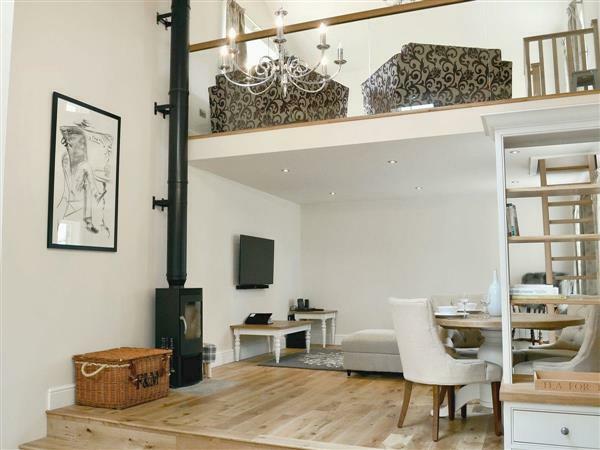 Stirton Burrow near Skipton is set in a small hamlet just 1¼ miles from the centre of Skipton; this carefully furnished and co-ordinated detached barn conversion provides a wonderful, secluded getaway from the bustle of everyday life. It lies adjacent to the owner’s home and is well placed for rural walking direct from the door up and around Sharphaw, or alternatively you can walk into the bustling market town of Skipton where the Norman castle stands proudly at the top of a broad, sweeping cobbled High Street. There is a variety of shops, pubs and restaurants to explore, as well as trips on the canal, an indoor swimming pool, pitch and putt, and an 18-hole golf course. York is just over an hour’s drive, as is the Lake District. The spa town of Harrogate is a ½-hour drive, and will satisfy the most ardent of shoppers; whilst there take time to have afternoon tea at Betty’s tea room. Alternatively, simply relax in your own hot tub and enjoy your surroundings. The shop and restaurant are ½ mile from Stirton Burrow near Skipton, with the pub 1 mile from Stirton Burrow. Open plan living space: With beams and oak floor. Kitchen area: With Esse electric range, fridge/freezer and washer/dryer. Bedroom: With zip and link twin beds (can be super king-size on request). Shower room: With walk-in shower and toilet. Sitting area: Galleried with French doors leading to garden (with slope access). Electric central heating, electricity, bed linen, towels and Wi-Fi included. Initial logs for wood burner included. Welcome pack. Lawned garden with patio, garden furniture and gas barbecue. Hot tub for 2 (private). Private parking for 1 car. No smoking. Please note: The property has a natural water supply from a spring. Holidays at Stirton Burrow run from Saturday to Saturday. Pets allowed at Stirton Burrow. For a better idea of where Stirton Burrow is, you can see Stirton Burrow on the map below. Stirton Burrow is in North Yorkshire; should you be on the lookout for a special offer, you can find all the special offers in North Yorkshire. It's always worth checking to see what is on offer at the moment. Do you want to holiday near Stirton Burrow (UKC2013), you can see other cottages within 25 miles of Stirton Burrow; have a look to find your perfect holiday location.